Last year we tried something new at our church. Instead of a party on St. Nicholas Day, the 5th and 6th graders performed a play about St. Nicholas for all of the other children in our parish. The goal was to try to put the focus on St. Nicholas and his spirit of giving. I ended up with no photos (as I was crouched behind scenery hissing directions at the kids the whole time :), so I never got to post about it last year, but a friend just found a few I thought I would share. 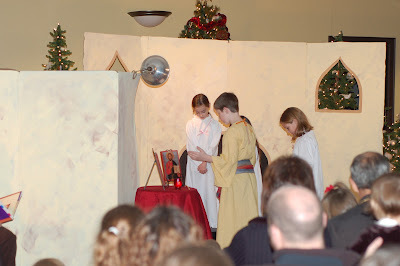 The play related the story of St. Nicholas saving three young girls from slavery by providing them with gold for their dowries. 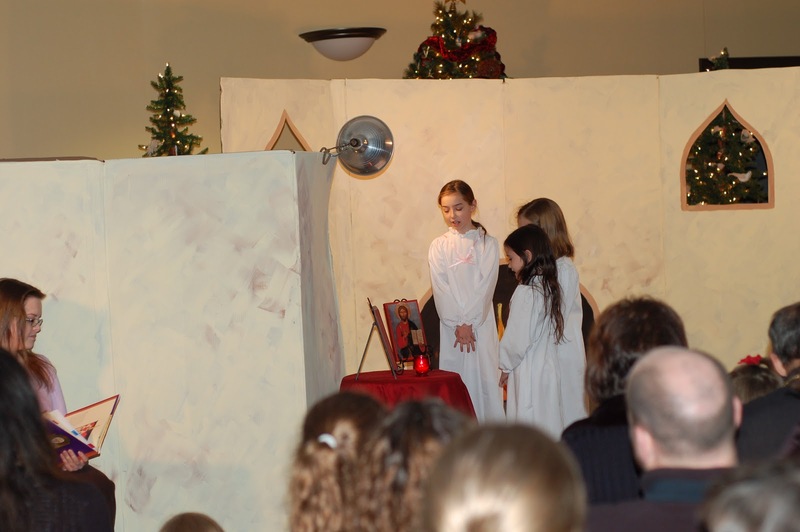 It was by no means a professional production (see the heat lamps hanging from scenery for spotlights :) but the kids really enjoyed it, and considering they pulled it off in just a month of rehearsals, and the scenery was made out of refrigerator boxes, I think it went pretty well! Here is the father and his daughters, praying to God to help them in their need. And here is our cast taking a bow. Before the play began, all of the children left their shoes outside, and at the end of the play they retrieved them to find gold coins waiting inside them. We finished the evening with a fasting potluck. This year, we are performing stories about St. Nicholas as the patron of sailors, hope to get someone to take photos for me this year! 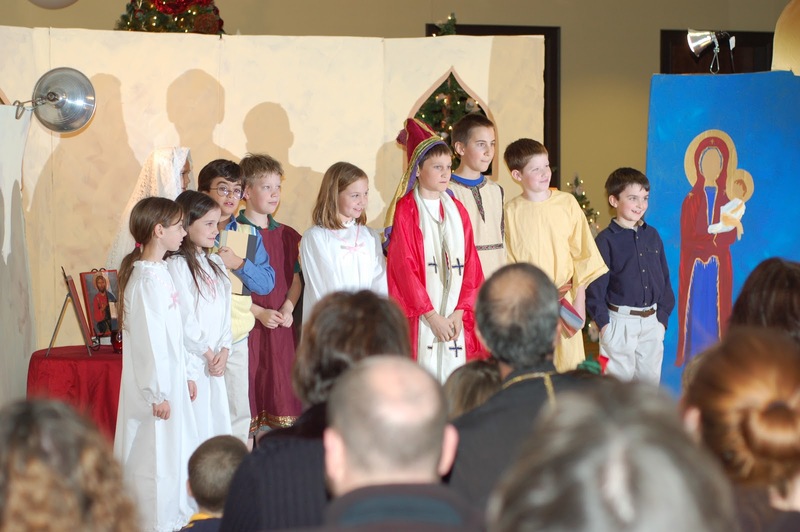 Last year's script was a combination of several from my old parish which has been doing a St. Nicholas play for over 20 years, so I cannot give credit to the person who originally created them* (edited: see note below). I made a few changes, and the script uses readings from Demi's The Legend of St. Nicholas as well. What does your parish do to celebrate St. Nicholas? Note: Thank you Erin for letting me know Esther was the author of the original script. May her memory be eternal. (which was originally inspired by your tea!) and is all about parish activities for which you have so many great ideas. We have someone come to church after Vespers the night before. He is dressed in full bishop robes and has a long white beard. The kids really get a kick out of it. Fun! I have fond memories of being in the play as a teenager. (Which, now makes me think that they've been doing the play for over 20 years! Yikes!) This year we're doing a little party with cookie decorating and carol singing after Vespers. Good chance to teach people some traditional Orthodox carols like "Heaven and Earth" and "There was Great Rejoicing." Those are our favorites. Oh, and I should mention that Esther wrote the original script. She was just about 12 or 13 when she wrote it. It just about made me cry to think of that. Memory Eternal. How fun! This is my first year at our new parish, but they have been rehearsing the Vespers' hymnography for the past month. Sunday night, all the children will be singing and reading for the Vespers service eve (or morning, depending on how you view it) of the feast, including the stichera. Before the service, all of the children take off their shoes and leave them in the narthex, and they will be reminded, as they are every year, that if they sing, St. Nicholas has been known to leave a treat for all the children who are heard praising God. 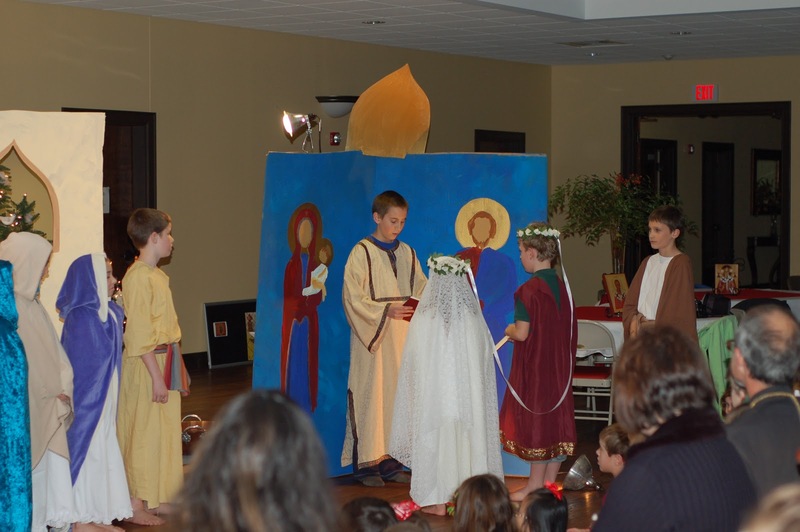 I love how our current parish always seem to encourage the children's participation in the liturgical life of the church. Erin - thank you so much for letting me know - I had no idea Esther wrote that! Gives a whole new meaning to carrying on this tradition. I so enjoyed that play every year - btw, your sis is helping me out this year (thank goodness) she is awesome to work with! Michelle M - I love the idea of someone dressed as St. Nicholas, another parish near us has done that before, you have to have just the right person to pull it off though! Maybe one year we will give it a try, I have someone in mind who would be willing I think. Wendy - love the singing, we wanted to have all the kids learn the troparion, but I admit I let the ball drop on that one (and I can't sing) but am hoping that in the future we can add some singing as well. Thanks for this post. Last year we began making our St. Nicholas celebration a service project for the children in our parish. Since we do things throughout the year for them that are 'fun' and focused on them (VCS in summer, Harvest Party in fall, Bright Monday party in spring) we wanted them to learn how St. Nicholas focused on others. Last year, we assembled about 40 gift bags of necessities and goodies (mittens, hats, toothbrushes, soap, lip balm, gum, crayons, small party-favor type toys, etc.) for children at a local homeless shelter. Our children colored and decorated the bags and then in assembly-line fashion put one of each item in the gift bag and then got in line and went around the table again until all were finished. As adults, we were so blessed to see truly how much fun the children had putting together these gifts for other kids. We talked to them a little about homelessness and they were surprised to learn that children right in our neighborhood don't have all the material things they are used to having at their homes. Cheryl - thank you so much for sharing! I love this idea - and I agree, it is so easy for a St. Nicholas celebration to become a Christmas party during Advent, losing all of the spirit of St. Nicholas. In the past we have done some service projects, and I would love to find a way to incorporate that again. This is our first Advent at this parish and so I only know what I've been told. This Sunday evening we're having Vespers for St. Nicholas followed by a little celebration for the children. While they sing ("Oh, who loves..") and eat a fasting supper (I'm bringing spaghetti) their shoes, which they left outside, will be filled with gold coins. To be honest, I'm not sure what else they do! I hope to be more involved next year. At our last mission the children did a Christmas play which wound up on youtube, courtesy of one of the parents. It's a riot! My youngest was two and a sheep. He wandered, as all sheeps do, and then tried to kidnap baby Jesus out of the manger. When he was foiled, he ran around "backstage" to the kitchen and stuffed two brownies in his mouth. I still laugh when I watch it. I just made the connection of which Esther this was. I just about cried all over again. Lord have mercy. What a blessing the play has kept going.